Hooh hooooo looky looky! LOVE this little mini dress ! 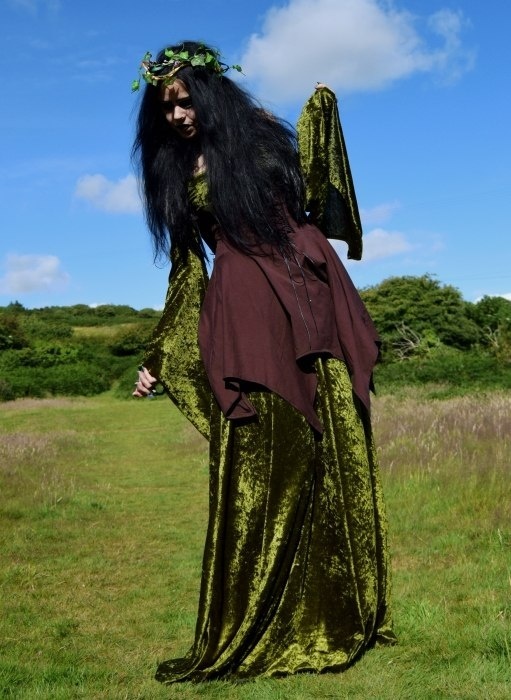 All elven and medieval and witchy all in one, and just perfect to finish any outfit off! It starts off with a huuuuge hood, then goes down to the waistline with a high back an underbust bodice, with some looped braiding and a ribbon fastening. An awesome pointy hemmed mini skirt is attached and there you go!!!! Off to the forest with you for a merry dance! Oh or maybe a local tavern for some rather tasty noms and beer!! Whereever you go, you'll be looking gorgeous!!! It's shown here in Elven Brown Cotton, and of course it looks amazing paired with our Goldberry Dress (as shown) - we also make a sister version in steamed velvet, theElanorwen!